Good morning!!! Hope everyone is well today!!! Today's post comes from the drafts folder of The Little Canvas. Yes, I have plenty of new manicures to show you, but I couldn't go another day not sharing it. 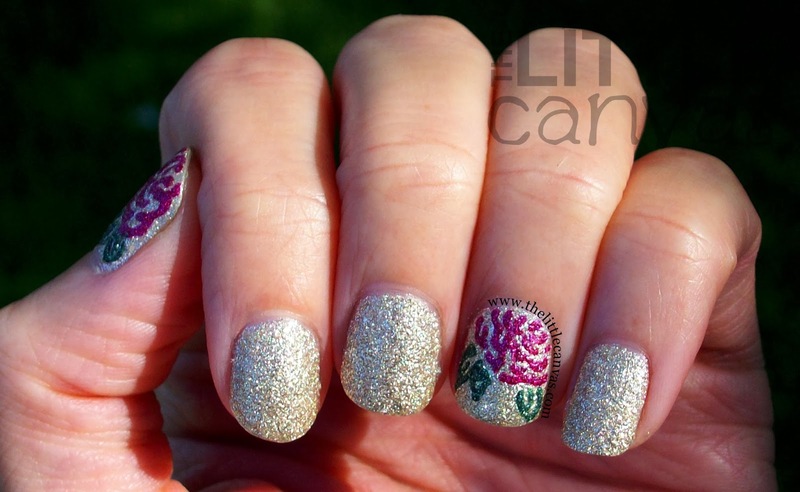 The main reason being, it's a gorgeous manicure done using only Zoya Pixie Dust polishes. You know, my favorite textured polishes in the whole wide world. A while back, Casey showed me this manicure by Jess of @miss_prettynails on Instagram because she knows how much I love creating nail art designs with the textured polishes. I pretty much tripped over myself to take whatever manicure I was wearing off to re-create this gorgeous look. Seriously, roses + pixies, how could you go wrong? Gorgeous right? I wish you could have seen how sparkly this manicure truly was!! You can tell that it kind of made my camera go crazy and not be able to 100% focus on all the shots. It kept catching the shimmer of the glitter in the polish each time I tried to snap the photo. Have I mentioned that I love Tomoko? Next to Stevie, I think it's my favorite Pixie Dust. Tomoko is an AMAZING color with the perfect amount of glittery goodness. It reminds me of champagne. I used three coats in this manicure, but really could have gotten away with two. Just as I have found with all of my other Pixie Dust polishes, Arabella and Chita were amazing for nail art! 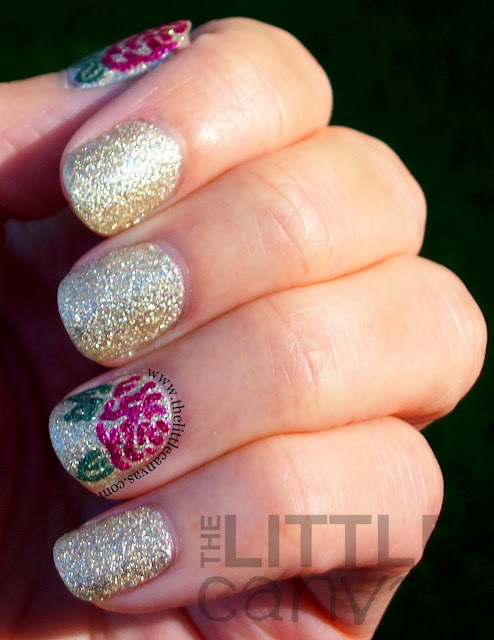 For as fast as they dry on the nail, they don't dry too fast that you can't work with them to draw designs such as these roses. To get the look, I started with my base coat of Tomoko. 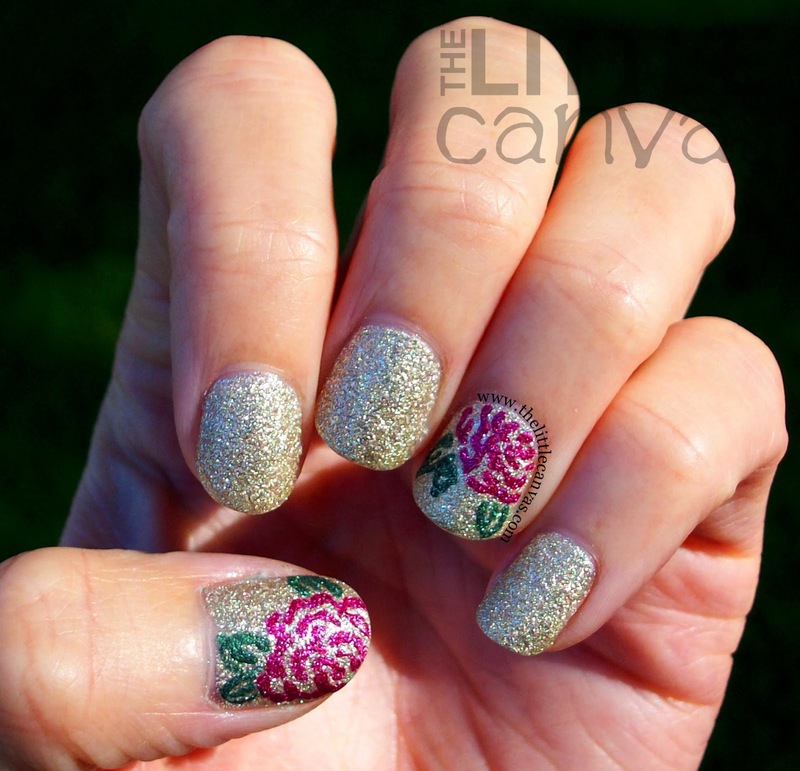 When the base was dry, I use my nail art brush and Arabella to draw on the rose petals. After that, I used Chita to add the outer green leaves. What do you think? Liking the Pixie Dusts? Loving art done using them? The Zoya Pixie Dusts that were used in this manicure are all from the Fall 2013 collection and can be purchased on Zoya's website!